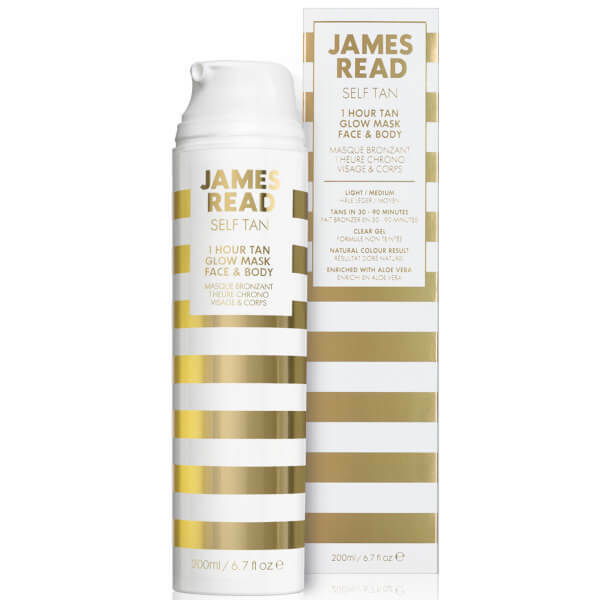 Get glowing in an hour with the 1 Hour Glow Face and Body Mask from James Read; a colourless express tanning gel that creates the natural sun-kissed glow of summer in no time. Fast-acting and non-sticky, the results are controllable; achieve a golden glow in 30 minutes, a medium tan in 60 minutes and a deep bronze in 90 minutes. 1. Using a dry Tanning Mitt, apply to the body in sections using circular motions, starting at the ankles and working your way up. 2. 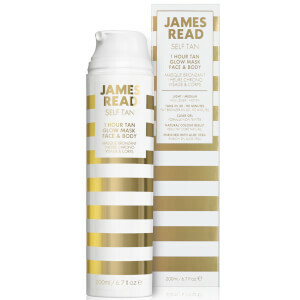 Ensure the tan has been applied all over using the product's sheen as a guide. Leave feet and hands until last using what remains on the mitt. 3. Wait for 30 minutes for a light tan, 60 minutes for a medium tan or 90 minutes for a deeper tan. 4. Avoid contact with water for 30-90 minutes and then rinse. 5. To prolong and maintain your tan, moisturise daily, exfoliate regularly and reapply as desired. Aqua/Water/Eau, Dihydroxyacetone, Dimethicone, Dimethyl Isosorbide, Glycerin, Phenoxyethanol, Erythrulose, Cyclopentasiloxane, Polyacrylamide, Polysorbate 20, Sodium Acrylate/Sodium Acryloyldimethyl Taurate Copolymer,Cyclohexasiloxane, C13-14 Isoparaffin, Xanthan Gum, Isohexadecane, Polysorbate 80, Simmondsia Chinensis (Jojoba) Seed Oil, Panthenol, Tocopheryl Acetate, Aloe Barbadensis (Aloe Vera) Leaf Juice, Ethylhexylglycerin, Laureth-7, Alcohol Denat., Lecithin, Cucumis Sativus (Cucumber) Fruit Extract, Ahnfeltia Concinna (Algae) Extract, Yogurt Extract, Hyaluronic Acid, Rosa Damascena (Damask Rose) Flower Oil, Potassium Sorbate, Benzyl Alcohol, Sodium Benzoate, Sodium Dehydroacetate,Sodium Salicylate, Ubiquinone, Tetrasodium EDTA, Citric Acid.